The aim of the historical society is to research preserve and make available archives, artefacts and information relating to Stockcross and the Surrounding Area and to encourage active interest and participation in our local history. 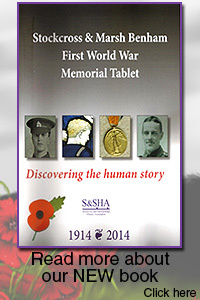 Our society was formed in September 2013 initially to research the lives of the 27 men on the Stockcross and Marsh Benham War Memorial Tablet. We were helped by the receipt of a grant from the Heritage Lottery Fund "1st World War Then and now" programme which has resulted in a book exhibition and this website. We welcome new members and guests, please visit the Membership page for more information. You can purchase membership via our online shop. Error: Error validating access token: Session has expired on Monday, 25-Mar-19 08:20:45 PDT. The current time is Friday, 19-Apr-19 15:18:57 PDT.